For the purposes of this series, I will be using the model designed by Dr. Thomas Brown. You can find his website HERE. Executive functions are a weekly topic of conversation in our private Coaching Corner group. This is because because executive functions touch every aspect of our lives. From maintaining our homes to functioning at work and everything in between, lack of executive function skills pervades almost every aspect of your life when you live with ADHD. As you might be aware, I feel that if you have ADHD you most likely have Executive Function Disorder. Activation, or getting started is a topic that I deal with on a fairly consistent basis, both personally and in my conversations with group members. As a rule, those of us with ADHD have a hard time motivating ourselves to do anything that is not of sincere interest to us. Trying to start and complete a task that we dislike or deem boring is much like pulling out our eyelashes one-by-one. And so we procrastinate, and make excuses about what we need to do before we do this odious task. Why is activation so hard? Well…from what I have read, ADHD’ers have a hard time figuring out how to sequence a task. We see a huge project, but we cannot always picture the steps we need to take OR the end result. This inability to sequence results in feeling overwhelmed before we even get started. Overwhelm leads to procrastination and, at its worst, self-sabotage. Some of us actually lack the necessary amount of certain brain chemicals, such as serotonin and dopamine, to activate ourselves to action. This is why when we take our medications we often feel more motivated. When I was teaching I was taught to plan all my lessons by, “beginning with the end in mind.” In other words, I had to figure out my endgame before I laid out all the steps. – Write down all of the steps you need to take to complete the task. – Try to organize the steps in a linear way so that you can see the path in front of you. – Determine if you need to gather any materials or supplies. – Decide on a half-way point. – Set a timer, work for 10 minutes and see how you feel. Activation is one of those things you can exercise, like a muscle. The better you become at analyzing why getting started is so hard, the easier it will be to form a plan. In the words of Jennie Friedman, “just touch it.”. As in, just get started. Literally touch something that is related to the task you are trying to start. See what happens. I tried this with emptying the dishwasher once. I had been procrastinating about it so I picked out one fork and put it away. Then another. It actually worked. Finally, look for ways to help yourself. Helpful things include body doubling sessions with friends or virtually. We body double all the time in Coaching Corner, and it definitely helps us to get started on our work and personal projects. Go easy on yourself. 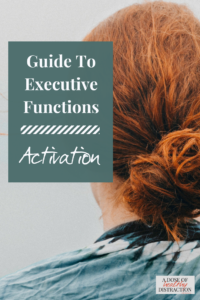 Learn as much as you can about the connection between ADHD and Executive Functions. Next time we’ll talk focus and concentration. Join my semi-regular email list and receive my favorite web resources and 5 days of informational/fun videos straight from me!